Trust me. I know it is not summer, especially not in the northern cities where some of you are undoubtedly curled up by the fire with a cup of hot cocoa. Today in Charleston, it is sunny and seventy degrees outside. The humidity in the air makes it feel like late spring or summer; it is not even the warm weather of fall here. Luckily for me, berries are almost always available at every grocery store. They may not be the ripest, juiciest strawberries or blueberries, but nevertheless, they are there and they are edible. The sugar that you cook the fruit in pretty much masks all evidence that they are not in season and simply enhances the natural sweetness of the berries. This is the easiest dessert I have ever made, save scooping Ben and Jerry's Brownie Batter ice cream into a bowl. This pudding proves that sometimes the simplest of flavor combinations and preparations serve you best. They satisfy your cravings and bring a smile to your face, but they don't cost you very much time or money. Vibrant. 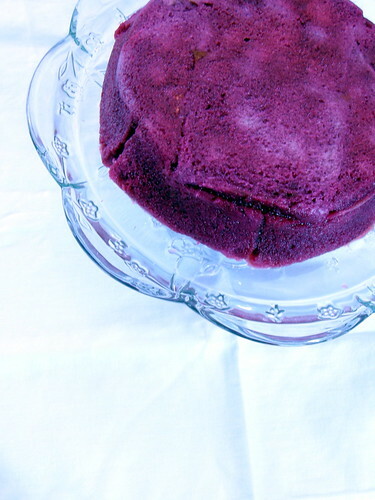 That was the first thing that came to my mind when I was greeted by the beautiful, magenta hue of the pudding. I almost didn't want to cut into it. I simply wanted to stare at the pudding all day. The color should have tipped me off about the lovely, bright flavor that was hidden inside. This pudding's fresh, bracing flavor will taste incredible after the Southwestern meal we are having for dinner tonight. Warm berries and sugar in a saucepan. Cook until berries break down and release their juices. Remove from heat and stir in kirsch. Line a 1 1/2-quart soufflé dish with plastic wrap. Line sides and bottom with bread. 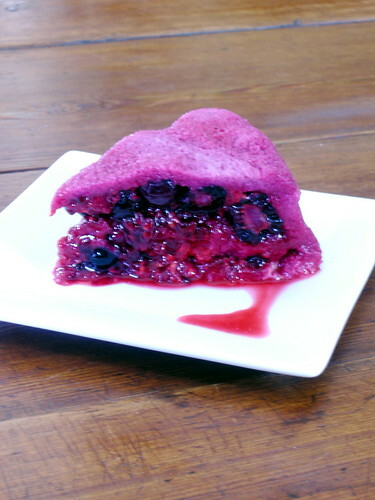 Pour half of the berries into the bread-lined dish and spread them over bottom layer of bread to cover. Make another layer of bread slices over berries. Add remaining berries and cover with final layer of bread. Place plastic wrap on top, cover with plate, and place a can of soup or tomatoes on plate to weigh pudding down. Refrigerate overnight. 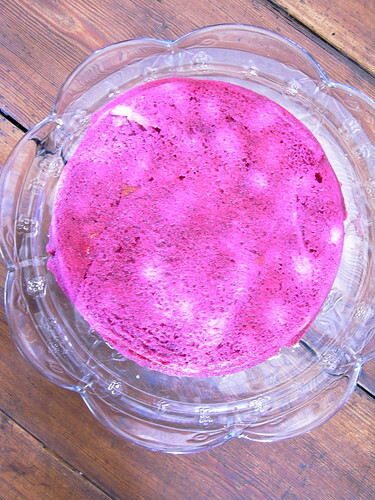 Remove plastic wrap on top, invert pudding onto a plate, and lift off the dish. Remove rest of plastic, slice pudding, and serve with whipped cream. Thanks for checking out my blog! It was so delicious; my dad ate almost the whole thing. I don't generally post the recipes on my site because I feel that it would steal David Lebovitz's thunder a bit, but I would be more than happy to bring you a copy of the recipe! ps, do I by chance recognize this cake pedestal? so you just used regular bread?